Celebrating the upcoming rhythmic gymnastics at the 2012 Summer Olympic Games, here is a dance-related walking tour in Paris, with just a dash of gossip for fun. Cendrillon, grab your slippers, veils, and tutus because this week we’re headed to a fête with a twist in the Cimetière de Montmartre. Follow my lead! On May 3, 1987, Yolanda Gigliotti, better known as pop idol Dalida (the female Elvis of France), took a handful of pills, put on her sunglasses and “left our world for another,” as the official fan website puts it. Try listening to her catchy “Itsy Bitsy Petit Bikini” song without dancing, singing along, and then hitting repeat. I’ve tried but no can do. 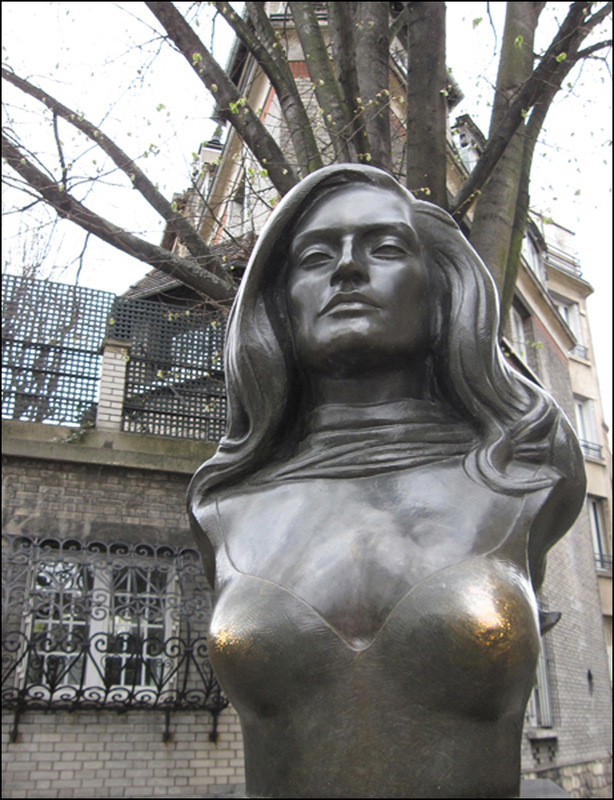 In addition to her grave, Dalida’s house is located at the end of rue d’Orchampt, while her bust is at the tip of rues Girardon and Abreuvoir in Montmartre. Pilgrims still visit all three shrines. Katy Perry’s fireworks got nothing on you, Dalida! 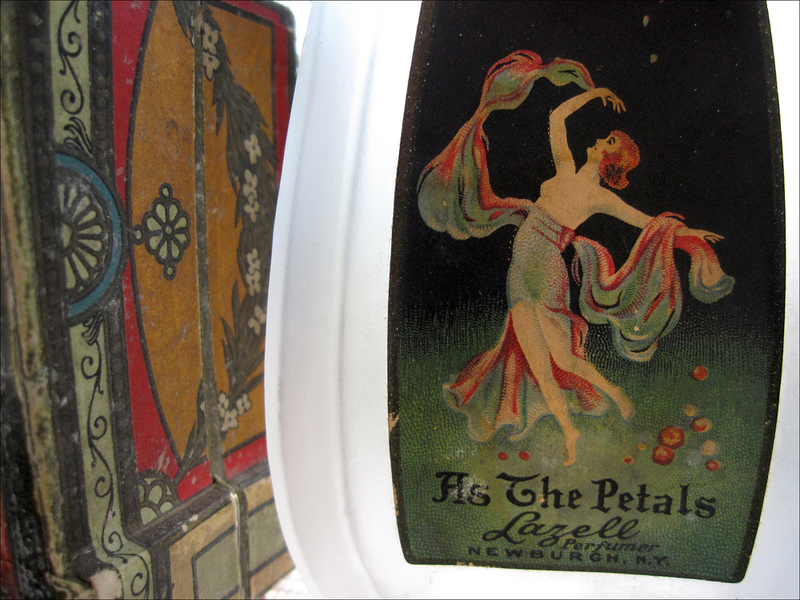 Famed terpsichorean Louise Weber, a.k.a. 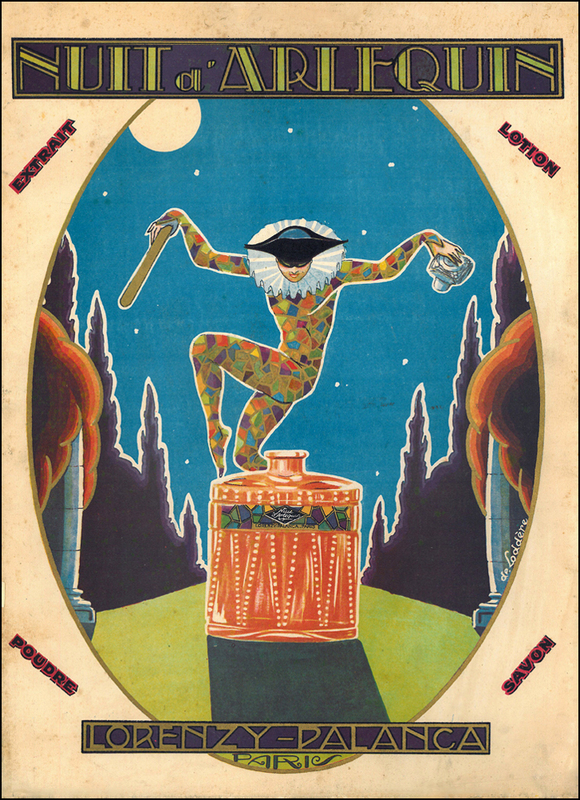 La Goulue (the Glutton) was Queen of the Can Can and a favorite muse of Henri de Toulouse-Lautrec. She earned her moniker for nipping drinks from her audience while distracting them with her pantaloons and little pet goat. “When I see my behind in these paintings, I find it beautiful!” she once quipped. Dance master for Louis XVI, Gaétan Vestris was first to drop the mask during performances, and rely on expressive good looks alone. Vanity-inspired innovation, perhaps? “There are but three great men in Europe—the king of Prussia, Voltaire and I,” was his favorite boast. 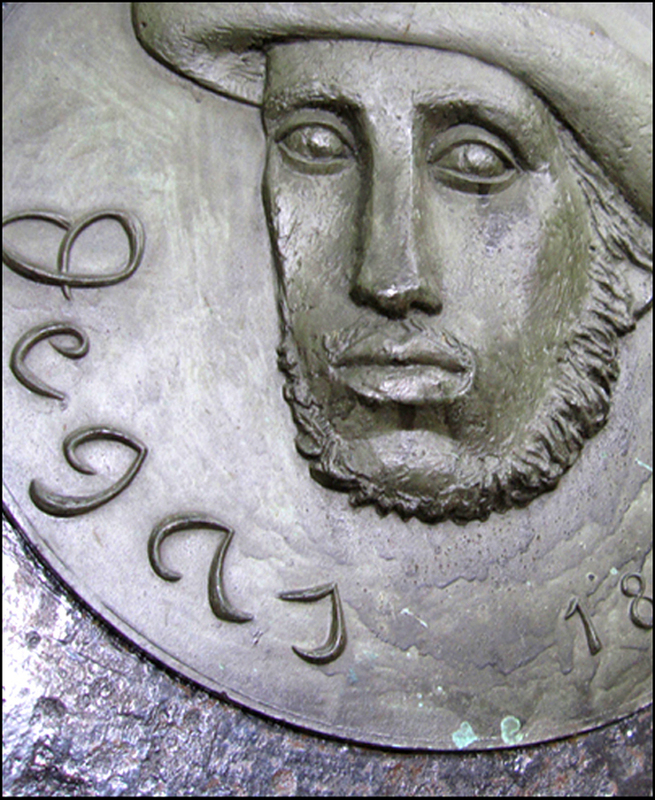 Fast forward: His son Auguste Vestris held court at the Paris Opera for decades, where he busted a sissonne (flying) move and made the people-pleasing gavotte his own. Even dancing queen Marie Antoinette was a fan! Marie Taglioni’s appearance in her father’s “La Sylphide” marked the arrival of the Romantics. Though she wasn’t the first to dance en pointe or don the muslin skirt (skimming the ankle much to the delight of every binocular-carrying fan! ), she’s the one who made it her own. “Shorten your dress just a little,” begged one admirer, according to a newspaper report in 1884. Taglioni’s popularity launched her name into the lingo: the verb Taglioniser (to be slender and graceful). And most coveted coiffeur? À la syphide! Though limelight stage lighting had the advantage of being a lot brighter than oil, it still wasn’t hazard-free. Taglioni protégé Emma Livry refused to soak her gauzy costume in fire-proofing because she abhorred the discoloring and feared it would weigh her down, but then tripped over a light, and set herself on fire. And now here she is! Riots erupted in Milan when Fanny Cerrito took the stage to challenge rival Taglioni. 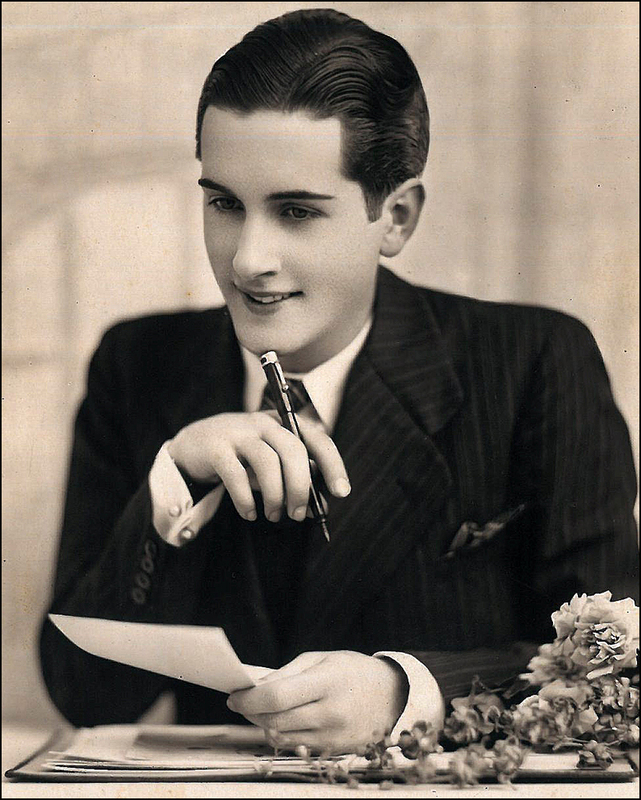 According to her choreographer husband, Arthur Saint-Leon, Cerrito was clearly the winner. “Taglioni’s leg encompassed a great deal of attention, while Cerrito’s leg magnified excitement.” Oh, la la. Courtier Paul Poiret (Le Magnifique) not only draped favorite client Isadora Duncan in diaphanous chitons made of Dijon-colored chiffon, but also performed with her at his infamous Ballets Russes-inspired tented backyard shindigs. Dig Degas? Don’t leave Paris without a spin around the Musée d’Orsay. After touring the cemetery, hop on the “95” bus. You’ll find the bus stop on rue Damrémont, just around the corner from Dalida’s Bambino studio at 10 Rue Damrémont and Toulouse-Lautrec’s atelier at 7 rue Tourlaque. Still feel like dancing? 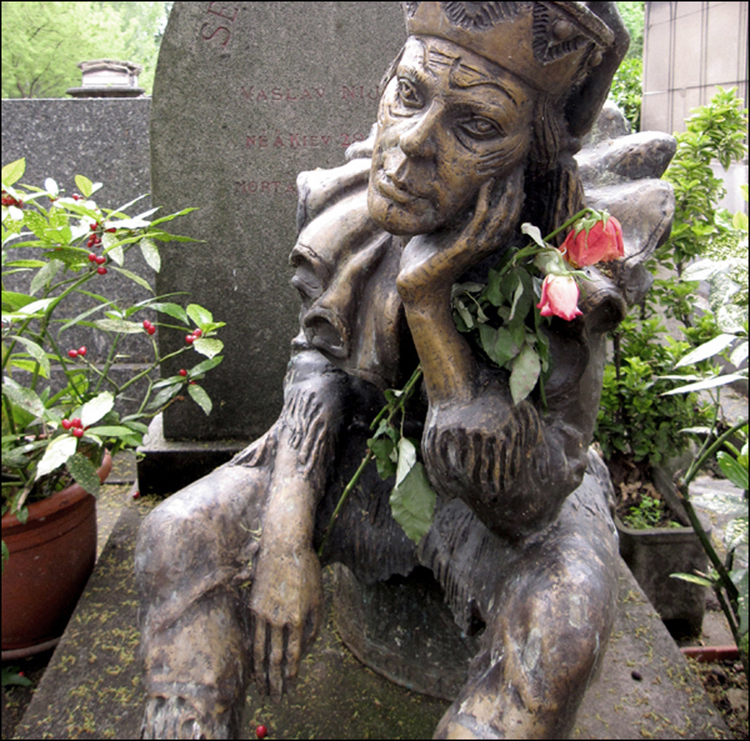 At the Cimetière du Pere Lachaise, you’ll find still more: Jane Avril, Isadora Duncan, Loïe Fuller, Cléo de Mérode, and Alwin Nikolais (to name but a few) await you. Keep on dancing and a-prancing! T — whenever we finally get to Paris, I’m taking all your yummy, beautiful delicious posts with me. Thank you. Thank you, Brigitte!! You made my week!! T.
Thank you, Pam!! One day I’ll visit Paris, Kentucky. Interesting history! Plus, it has the world’s tallest three-story building, the rather handsome Shinner Building—according to Ripley’s Believe it or Not. It’s a looker! T.
I did not realize that and I live about 50 miles away! Thanks for the info. T – I’m with Brigitte. I need to dedicate a day to trawling through your gorgeous blog and pick up all your tips for our up-coming Paris adventure. Merci, merci beaucoup pour ce tour merveilleux, Mlle Babs!!! I has a cassette of Dalida (alas, no longer, and no cassette deck, either) given me in 1982 by my cousin in Genova. She was wonderful!!! Another Dalida fan?! She was fantastical!! What a perfect gift. Do you remember the title? Here’s another favorite Dalida tune. “Bambino” was her very first hit in 1956. Wow, thanks for the link, Babs…have a great ‘Dimanche’ yourself!!! Well done! This was great fun. Thank you!! Yes!! Dalida’s sweet cover was featured in Philippe Le Guay’s “Les femmes du 6ème étage Great film, eh? I especially loved the “Itsi bitsi teeni weeni” scene. It sizzled. Very cute!! T.
Yes, a lovely film. Thanks for sharing the clip, Theadora. Yes, fascinating for sure. And always and adventure. 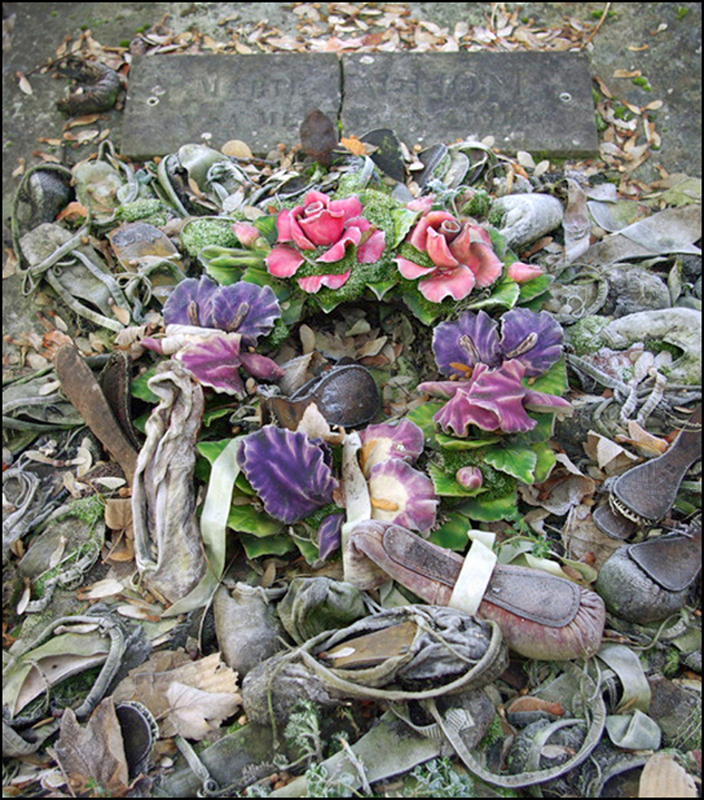 The photograph of the ballet slippers on the grave was especially poignant and beautiful. I will think about that image, long after my eyes leave the computer screen view. I appreciate your following, too. Thank you, Ruth!! As you know, I’m a fan of your photography. Your recent “Phantom’s Revenge Riders Fly Towards the Full Moon” shot was amazing!! Let’s not forget to pay homage to Flat Ruthie’s worldwide adventures. The posts make me smile every time. Bravo!! Theadora The first time I spotted the shoe shrine, I wept. And wept. I discovered Taglioni and Dalida on the same cold November day (All Saints Day). That was a great day. Just an “itsi bitsi teeni weeni” comment–I loved it! Cute and sassy, Martino!! Merci. Merci. T.
My husband and I spent the better part of a day at this cemetery, enjoying all the magnificent tombs, the masses of flowers (it was springtime) and the many strolling and lolling cats, including one green-eyed minx on Hector Berlioz’s grave! Merci, Theodora! Non, I missed the cat food boxes! We will have to look for them on our next trip…Have a good weekend too! I’ll be browsing tomorrow T an finalizing the list. We leave Sunday! We’ll be in your fair city Monday morning 🙂 Can’t wait! How is the weather?! So excited! Bon Voyage, Shira!! Enjoy the food markets. I’m looking forward to your reports. Don’t forget to pay homage to Julia Child at the kitchen-equipment specialist E. Dehillerin! It’s located at 18 Rue Coquillière (Métro: Les Halles). Julia’s photograph is behind the cash register. Enjoy! Enjoy! Enjoy! T.
Love the concept of Paris and Dance! Danced for quite a few years myself! Merci!! Do you still dance? What’s your specialty?! T.
Ballet…been a few year since I have been to class, but I love it. Particularly like the pic with the point shoes! Wow! I’m jealous. I should try it sometime. A few years ago, I took trapeze lessons. Great exercise! T.
You should try…especially in France. It is an amazing discipline…so strengthening and the piano music that accompanies is magic. you’re doing excellent work t. ……..i couldn’t return my emails right away…..there was something about texas that juiced my creativity….i recommend it. Thank you. You’ve been in a zone. Yesterday’s “Both Sides of a Dream” post was lovely. I especially loved your description of flying: “Last night I dreamt that I was flying through the air, high above the world, tangled and bound in a wrapping of shredded sheet music. Black chords, long stave’s and striped bars tripped off the pages left behind me like a ladder to nowhere; folded flying melodies unsung in the wake of my passing.” Beautiful. Haunting. T.
Thank you, Thom!! I feel the same way about your FAB New York, New York site. I love your tours. Today’s nod to the American Museum of Natural History and Zabar’s was pretty darn terrific. Both are favorite spots. I love black and white cookies. Dangerous!! T.
I have recently become acquainted with Loie Fuller via a director’s cut of Top Hat with Fred and Ginger. What an amazing dancer and just a damn fascinating woman. I think there is a museum in southern Washington state or somewhere that has a permanent exhibit for her. Great post. I keep adding to my list of things to do in Paris. Such a beautiful post! I did a mini-tour of the dance-related sights in Montmartre (except Dalida, I’ve always run out of time for her). It’s such an amazing way to tour that part of the city! On my last trip, I also visited the museum at the Opéra, and got to see the many beautiful paintings of dancers like Taglioni who made Paris and ballet synonymous for beauty and grace. I’m definitely finding her next time, that’s a promise! I agree! For the love of divas, Dalida was fun. I also dig her duets with Petula Clark! T.